Find out about the Events and Activities in the Shire. Pyrenees Shire Council has three pools and numerous playgrounds, parks and recreational reserves. 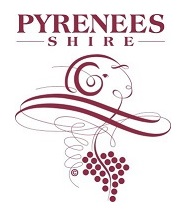 Pyrenees Shire Council has venues available for hire for meetings, events and conferences. Information about grants available from Council and other organisations. Information about community services at Council including Maternal and Child Health, Pyrenees Community Care and Community Action Plans. Information about the road network in the Pyrenees, including when you need to work on the road. Council's Environmental Health Officer works to promote the health and well-being of our communities through a range of public health services. Pyrenees Shire Council has two resource centres, one located in Beaufort and the other in Avoca. These centres are home to libraries, tourism information, community meeting spaces, free wi-fi and computer facilities. Council is inviting Pyrenees Shire communities and service groups to submit an Expression of Interest to host the Shire’s official Australia Day celebrations. Council would like to confirm a list of communities for the next five years.